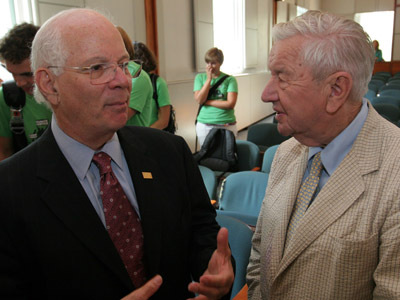 St. Mary’s College of Maryland mourns the passing of former trustee and St. Mary’s county statesman J. Frank Raley. Raley served on the St. Mary’s College Board of Trustees for 24 years (1967-1991) and was instrumental in establishing St. Mary’s as a four-year public liberal arts college. He counseled every college president from James Renwick Jackson to current President Joseph Urgo. J. Frank Raley was a visionary leader. He not only laid the foundation for St. Mary’s College of Maryland as a premier public liberal arts college, he was a chief supporter of the college’s mission and goals throughout his lifetime, said St. Mary’s College of Maryland’s President, Joseph Urgo. He made significant contributions to almost every area on campus, from the construction of residence halls and campus facilities to the establishment of the Center for the Study of Democracy, and the preservation of oral histories with the SlackWater Project. We continue to be grateful for his vision and leadership. Born in Park Hall, Maryland on September 13, 1926, Raley was a lifelong resident of St. Mary’s County. He attended Charlotte Hall Military Academy and earned his B.A. from Georgetown University. He served in the U.S. Army from 1944-1946 during World War II and returned to St. Mary’s to become an insurance agent and developer. Raley served in the Maryland House of Delegates from 1955-1958 and the Maryland Senate from 1963-1966. While in the General Assembly, Raley successfully secured funding for Lexington Park development, critical infrastructure, and for primary and secondary education. As a senator, he supported and passed legislation that transitioned St. Mary’s Junior College into St. Mary’s College of Maryland; a four-year, liberal arts, baccalaureate-granting public college. He continued to lobby on behalf of the college, generating funds for academic buildings and programs and sponsoring legislation that would give public colleges greater control over the raising of private funds. Those efforts led to the incorporation of the St. Mary’s College of Maryland Foundation in 1972 and the opportunity to raise and award scholarship aid to students. In addition to his trustee and elected official roles, Raley supported the integration of college faculty and the student body in the 1960’s and served on the executive, development and academic affairs committees before assuming the role as Vice Chairman of the Board from 1981-1991. In 1991, he was assigned to serve as the college’s designee to the St. Mary’s City Commission and in 1996 as a member of the Task Force on Affiliation between Historic St. Mary’s City Commission and St. Mary’s College of Maryland. J. Frank Raley had a passion for legacy, noted Maggie O’Brien, former president of St. Mary’s College of Maryland. He was an idealist, once promoting a new Maryland constitution, regularly reading John Locke, and always aspiring for his community something grander. He hoped especially for St. Mary’s College, and Historic St. Mary’s City, to reveal the highest principles of good government and good citizenship. Raley continued to serve on several commissions and boards related to the college while offering counsel to college administrators. He was awarded trustee emeritus status in 1996 and an honorary Doctor of Laws degree in 1998. He served as a member of The Center for the Study of Democracy Advisory Board since 2002 and has made several contributions to the SlackWater Journal Project. Raley was given the college’s highest honor, The Order of the Ark and Dove, in March of 2010. The award recognizes distinguished service to the college and highlighted forty years of service and advocacy. The college’s Great Room was also renamed the J. Frank Raley Great Room in 2010. Family will receive friends for Mr. Raley’s Life Celebration on Friday, August 24, 2012 from 2:00 p.m. until 8:00 p.m. at St. Michael’s Catholic Church, 16555 Three Notch Road, Ridge, MD 20680. Prayers will be recited at 7:00 p.m. A Mass of Christian Burial will be celebrated by Rev. Lee Fangmyer on Saturday, August 25, 2012 at 10:00 a.m. at St. Michael’s Church. Interment will follow in the church cemetery. Condolences to the family may be made at http://www.brinsfieldfuneral.com.